You think of Home Automation and immediately think of the Jetsons in a far away future. We’ll although this is an Industry that is still developing, having complete control of your appliances from wherever you are is a reality. There are companies already in the market that offer control over your objects. However, though every one of them claims to be “smart”, that’s not always the case. 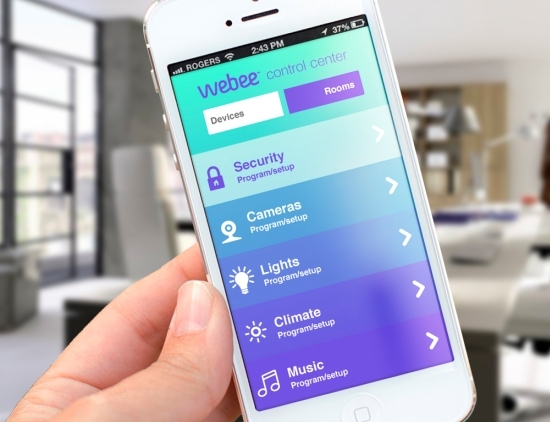 Webee Universe, developed the first REAL Home Automation System that allows you to control all your smart objects, no matter the manufacturer (it connects to ANY Wifi, Zigbee, ZWave operated device) from anywhere through an app. What makes Webee special is that it does all of this while learning from your behavior, providing you with better ways to use your appliances and objects. And THAT’S SMART! Webee will detect all of your smart objects through the smart hub we call Boss that connects them to the internet, allowing you to control them from wherever you are. Then, through the use of cloud algorithms, Webee will learn from your choices to then give you suggestions and alerts to save time, money and energy. Some people say that Home Automation is about laziness, or about not doing things. Sure, the essence of it is that Webee can do things for you, yes. But, what Webee aims to be in charge of, is the things that you don’t seem to remember: checking energy usage, not wasting resources. The reason you can’t remember them, is because you are probably taking care of many other things already! Webee knows that. We all have so many things to keep track of, chances are some are bound to be missed. You are getting the kids ready for school, and also thinking about that 9.30 board meeting, while remembering that bills are due today. All that information will likely leave no room to even think that if you turn on your washing machine at off-peak hours, you will save a lot of money. Webee remembers that for you. On a rainy Sunday afternoon, you are trying to cancel plans and keep the young ones entertained. Who can remember to turn off the sprinklers to not waste water! Webee alerts you of the weather forecast and suggest to not waste water if you don’t have to! We are not all the same and Webee knows that. Maybe your kids go to scholl in the afternoon, so that’s why it’s ok for them to watch a little TV in the morning. Maybe you return home every day at 6 PM and one day you’re late. Webee will notice. Every day, you will make choices that will make Webee get to know you. It will store all of this information in the cloud, to then suggest things that are specifically thought out for you. Webee will base on your particular needs, choices, schedules, lifestyle. What if you don’t own smart objects? No worries! You don’t need to go shopping for new appliances and throw away the ones you have. Webee came up with with affordable Plug and Play devices, called Bees, to turn your regular appliances into smart. It’s super easy as plugging something in or screwing in a light bulb. Now you will be able to manage the energy you use, receive alerts when something is out of the ordinary, use your electrical objects at off-peak hours. Right now, Webee is really close to getting mass scale production and is looking for customer validation through an Indiegogo campaign. The early adopters are the ones who are going to vouch for this exciting technology that, for the first time, brings a real smart option to the table. Join us in the Webee Universe! Eugenia Sincovich is currently the VP Community and Product Evangelism at Webee Universe.